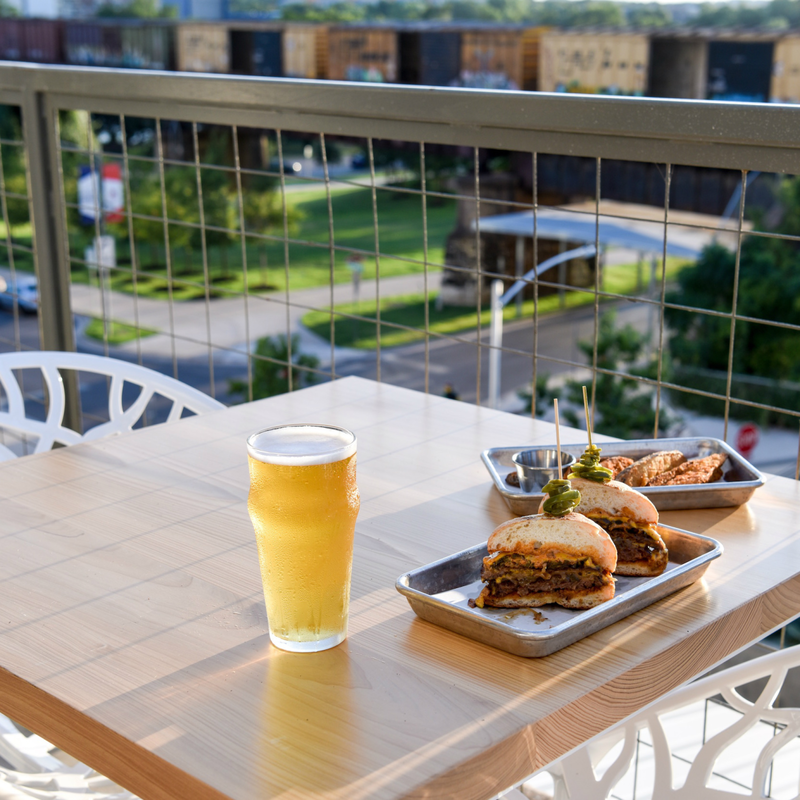 Now is the time to enjoy this sweet space atop Boiler Nine Bar + Grill. 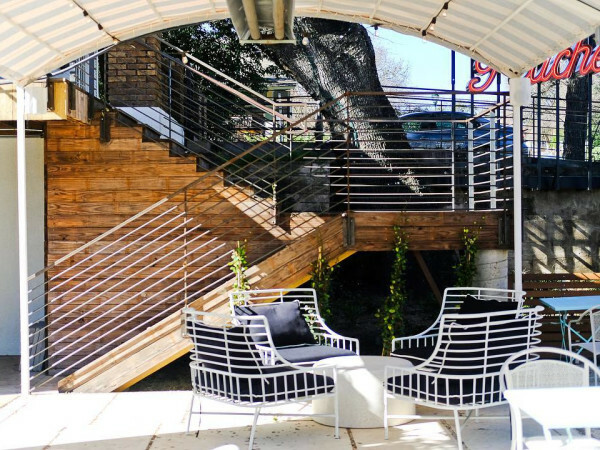 The covered rooftop deck is home to great drinks, picnic-y eats, and a laid-back vibe reminiscent of a backyard party. Favorite menu items include the classic flat top double double with American cheese, grilled peppers and onions, and house-pickled jalapeños, dressed with comeback sauce for a bit of Southern flare, and the brisket chili Frito pie topped with smoked pickled jalapeños, chopped onion, shredded cheddar, and sour cream. We hear that chef Jason Stude is making some tweaks to the menu for the fall, so be sure to check those out, and don’t forget to try one of the booze-your-own cocktails, which can be ordered individually or as a bottle for four. To celebrate the arrival of fall, chef/owner Shane Stark has added new menu items and is launching a "Taco Tuesday" special at his seafood emporium. We swooned over the sinful chicken-liver pâté, topped with Austin Eastciders’ Original cider gelée and served with truffled toast points, and devoured the perfectly cooked pan-roasted scallops with silky celeriac puree, lightly poached red pear, and herbed brown butter. If ocean fare is not your thing, try the 44 Farms strip loin with cheesy aligot potato and tarragon bordelaise. 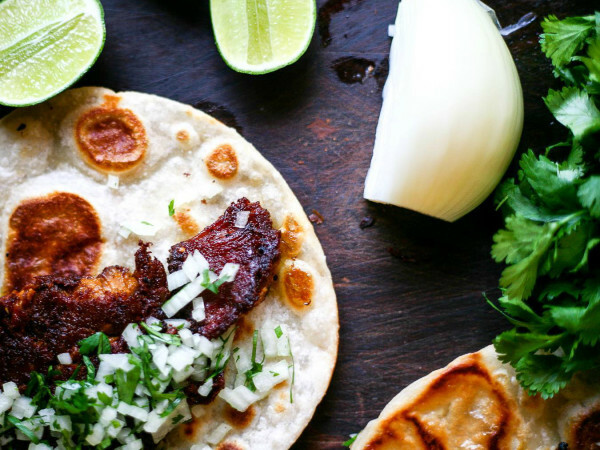 On Tuesdays, they serve $5 tacos with a choice of Gulf fish, shrimp, or oysters, topped with slaw and signature house-made sauce. 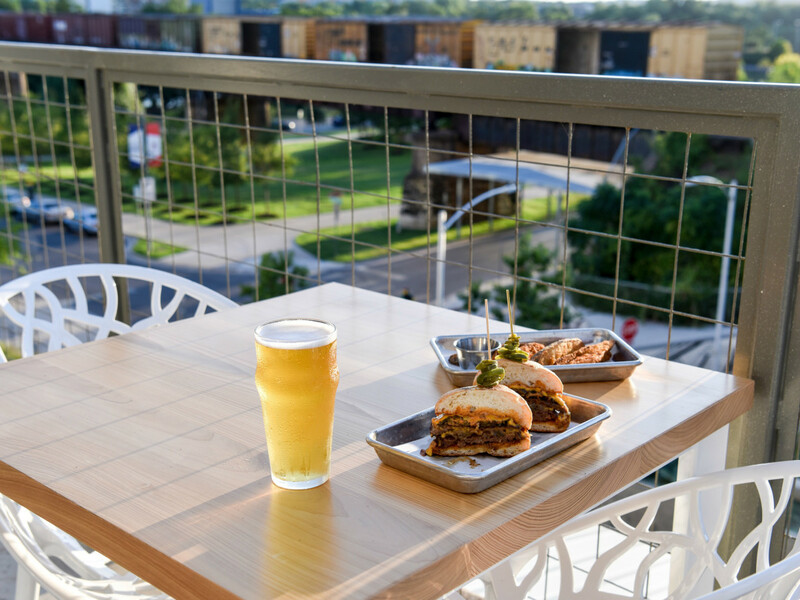 The small but welcoming covered patio is a sweet spot to enjoy happy hour, which features $6 select plates, $5 draft wine, and $1 off draft beer. 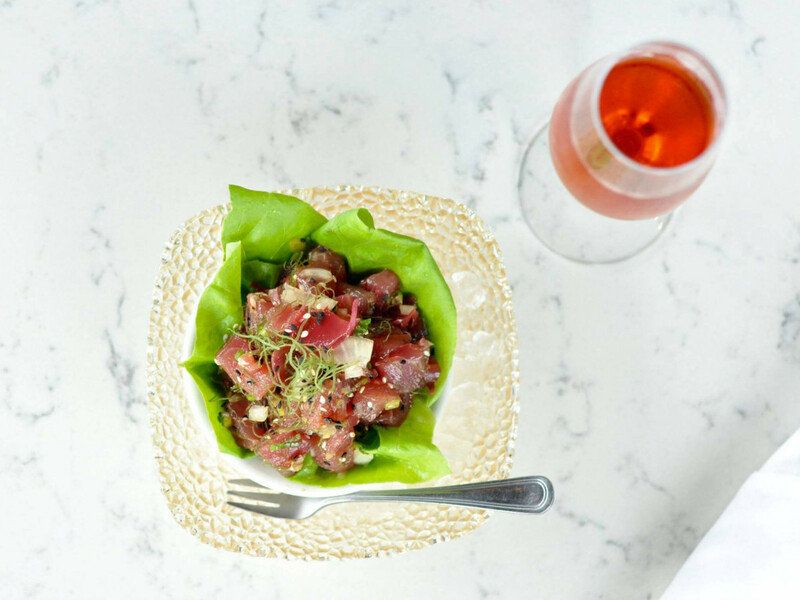 Although it seems everyone is serving poke these days, we have yet to find one as appealing as this one, made with tuna or hamachi and served during happy hour as “tacos” inside crisp lettuce leaves. At a time when bars and restaurants come and go, it is refreshing to see an old homegrown staple like Ranch 616 thriving. 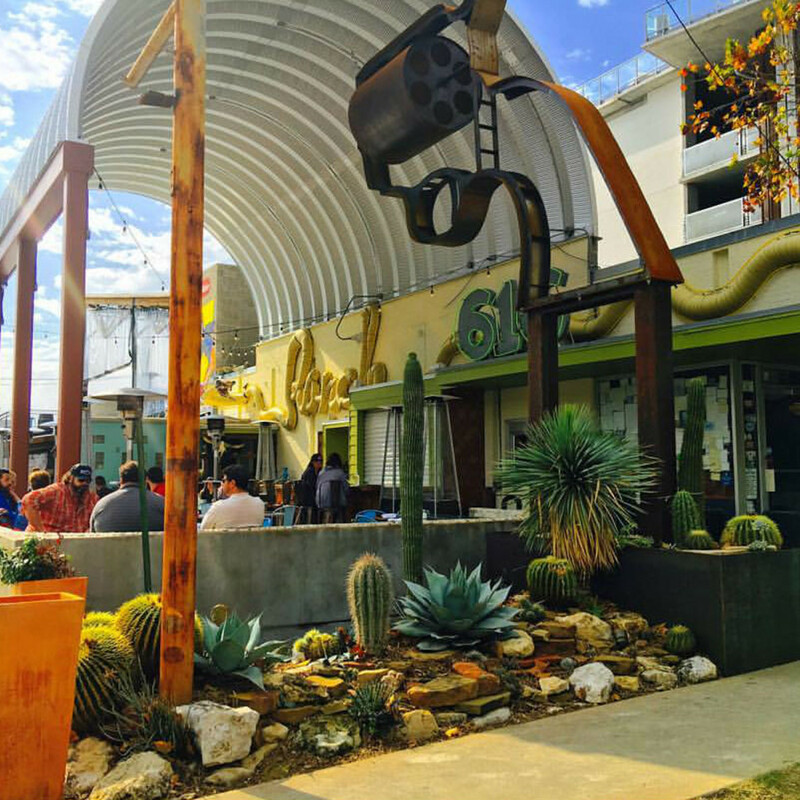 Aside from the South Texas icehouse-inspired menu and fabulous libations, the ever-evolving patio is a huge draw at this quirky downtown spot. 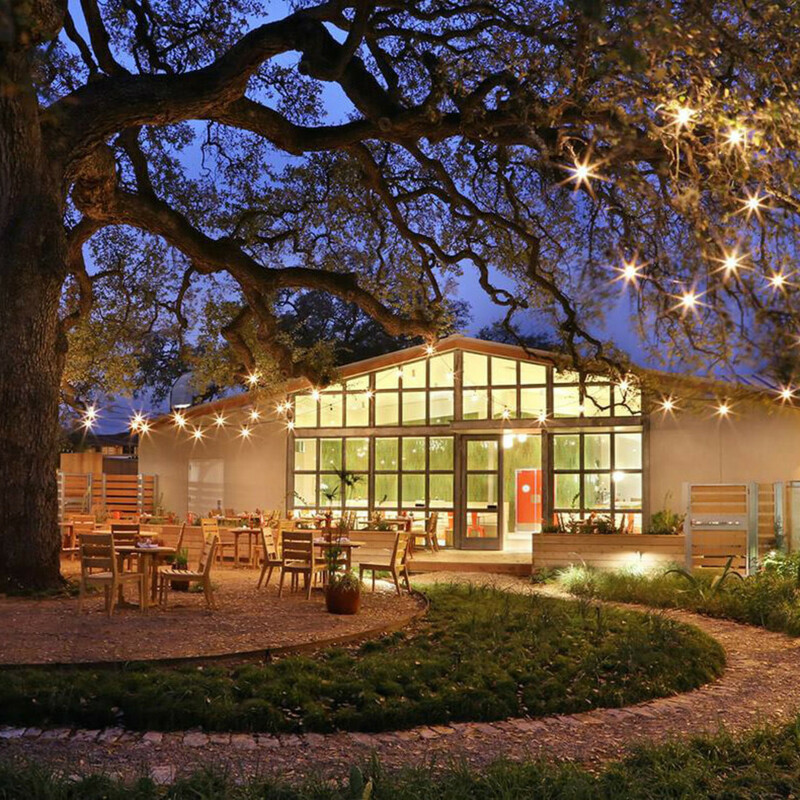 The 25-foot shade structure provides respite from the elements and lets diners enjoy the weather. 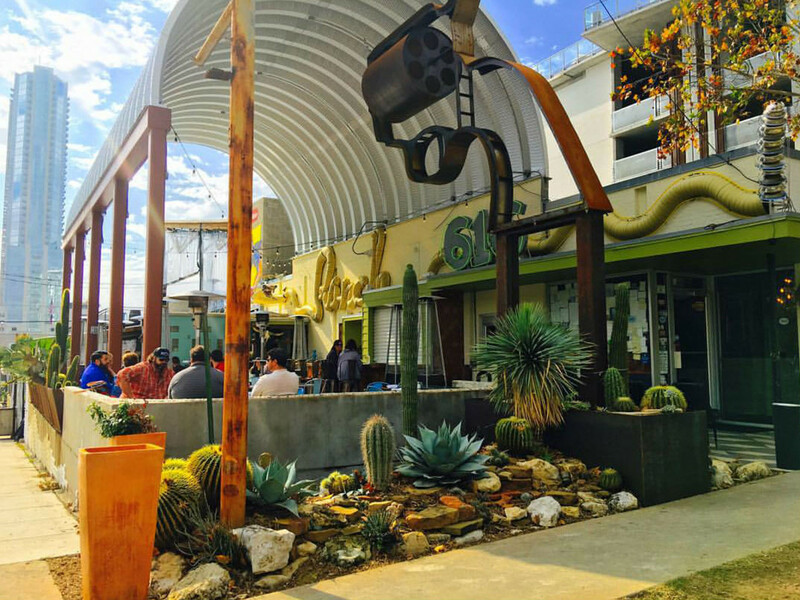 The giant vintage pistol sculpture from local artist Will Larson ties in with the whimsical Western-style decor, and the fire pit offers a cozy spot on chilly nights. Ranch 616 pours some of the best margaritas in town and excels at savory-spicy concoctions. Try the pineapple express, made with mezcal, tequila, fresh pineapple and lime juices, and a salt and chile rim. 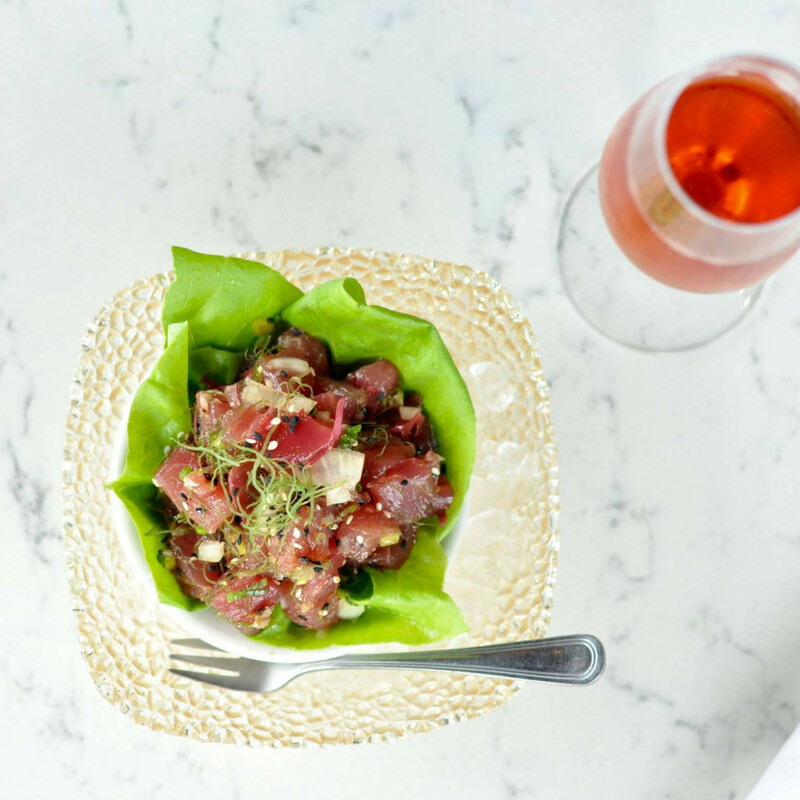 Menu highlights include the famed burger, the crispy fried oysters, and the divorced quail, but be sure to check out the daily specials from chefs Antonio Vidal and Kevin Williamson. One would be hard-pressed to find a lovelier patio than the one at this salad-centric enterprise. 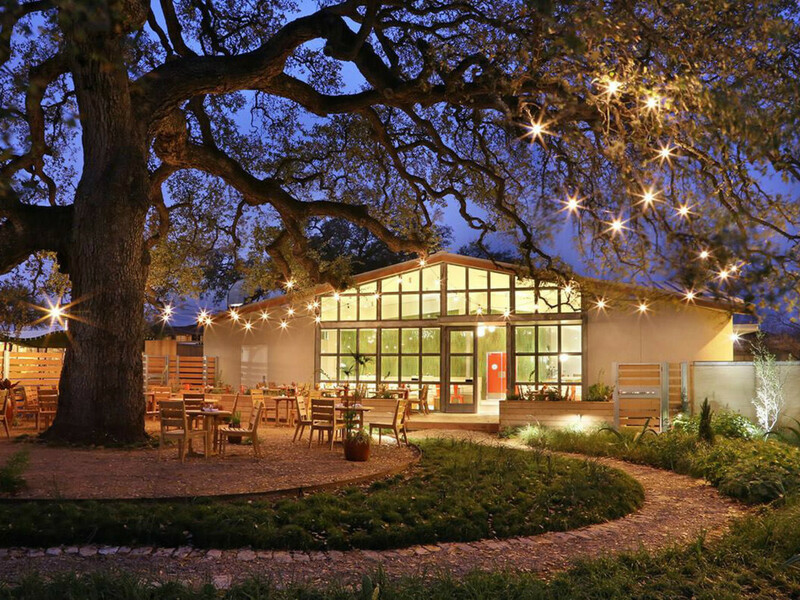 The refurbished South Austin space that once housed Treehouse Italian Grill boasts an ample, shady spot with lush landscaping under a majestic oak, perfect to while away an afternoon or evening with friends. Aside from an excellent selection of salads with add-your-own-protein options, the menu includes snacks, soups, and better-than-average sandwiches. We’re enjoying seasonal favorites like the apple-cheddar chop, featuring grilled pork tenderloin with baby arugula, julienne green apples, pickled fennel, and sharp cheddar, all tossed in a ruby port vinaigrette, and the arugula duck, which marries duck confit with baby arugula, goat cheese, balsamic roasted pears, and hibiscus vinaigrette. And we absolutely love the bright cocktails and mocktails made with fresh-pressed vegetable and fruit juices. 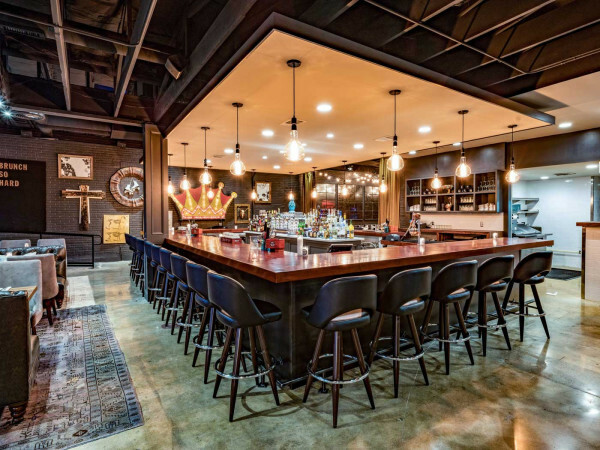 Why leave your four-legged family member at home when you can have a blast — and a casual meal — at the coolest dog-friendly hangout in town? New menu items include comfort food faves like mac 'n' cheese and Yukon gold potato soup flavored with onion, Swiss cheese, sherry, garlic, and thyme, both topped with your choice of bacon or fried onion strings. Yard Bar is also serving a new Cuban sandwich with oven-roasted pulled pork, ham, Swiss cheese, pickles, and mustard. After romping around with his friends, Benji will love the sliders from local outlet Bones & Co., made with beef, carrots, broccoli, squash, pumpkin, flax seed, and parsley.